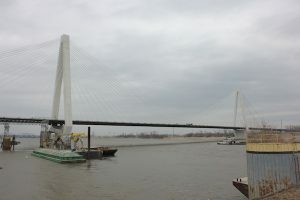 The New Mississippi River Bridge Project (Stan Musial Veterans Memorial Bridge) was built by the MTA Joint Venture, comprised of Massman Construction Co., Traylor Bros., Inc, and Alberici. 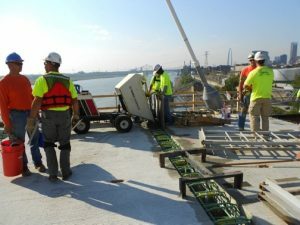 A part of a major effort by the Missouri Department of Transportation (MoDOT), Illinois Department of Transportation (IDOT), and federal government to re-route I-70 and alleviate congestion on the Poplar Street Bridge, the construction of the main bridge span was a $229.5 million portion of the $670 million overall project. 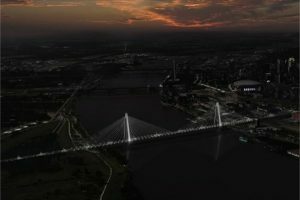 The bridge was designed by HNTB, and is a “harp-design” cable-stayed bridge with a 1,360 foot navigable span. The bridge was opened to traffic in February 2014. Our host, Alberici, is a major St. Louis contractor that has been in the business for 90 years. 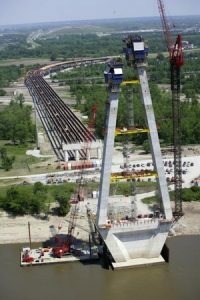 Specializing in heavy-civil and industrial projects, Alberici joint-ventured with other contractors in recent years to undertake major MoDOT bridge projects. Alberici is fifteen percent of the MTA Joint Venture, but was integral in providing self-perform labor for the project. On the project, operators, laborers, carpenters, and iron workers were used for self-perform work. One of the challenges of the project was fulfilling the labor requirements. Given the nature of the project as a bridge between Missouri and Illinois, there was a 50/50 split requirement for labor from Missouri and Illinois union halls. In addition, being a government project, there was an 18% requirement for certified disadvantaged business participation, 14.7% requirement for minority participation in each trade, and 6.9% female requirement for each trade. This proved challenging, not only to fulfill these requirements for specific trades, but also to maintaining these requirements as labor was scaled up and down through the course of the project. The project had a four year schedule, from January 2010 to February 2014. To pour the foundations for the two towers (over 400 feet tall), permanent steel casing were driven into the water and mud to bedrock. MTA proposed an alternate design to MoDOT that would require six shafts per pier, which was accepted. To accommodate this alternate design, a 12’-6” diameter Auger was used. Once the casing was set, the shafts were drilled and cored into bedrock. With the shafts drilled, rebar cages were craned in and installed. A concrete pump was then used to pour the shafts. Beginning at the bottom of the shaft, the pump tube was kept at five feet below the concrete surface. As the concrete rose, the water was pushed out. Once the six shafts were poured, a cofferdam was created using interlocking sheet piles. Once the water was pumped out, a 13’ seal pour was performed to counteract the water pressure from the soil below. With the seal pour complete, work could finally begin to set the rebar for the footing and begin pier shaft construction. To pour the towers, a self-climbing form system was used. This system allowed heights of 18’ to be poured at a time, with average lifts of 70-cy. At the top of each tower, where the north and south towers met, a 220 cy triangular wedge was poured to close the gap. Once the two towers were completed, work could finally begin on the span of the bridge. Starting from the base of the towers and cantilevering outward, pre-assembled steel field sections were craned into position. Each field section was comprised of a pair of edge girders and the steel girders spanning the width of the roadway, and corresponded to a pair of stay cables. 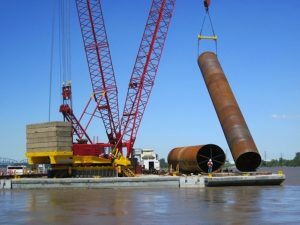 On the project, three cranes were used: two Manitowoc 2250 secured to the south end of each of the two towers, and a Manitowoc 7000 mounted on a ringer on a barge. Atop the steel girders, precast sections were placed, with small concrete pours to seal the joints. The final step to complete the span was pouring a 2” layer of latex overall concrete, which would serve as the final driving surface.